The power of using green tea has been demonstrated by numerous studies. Many people consume the tea as a refreshing beverage, or take it in the form of a pill to experience the benefits. Since green tea can be absorbed by the skin when applied topically, it is a popular ingredient in many of today's moisturizers. There are many different kinds of moisturizers that have green tea as an ingredient. These moisturizers are ideal for those who suffer from constant breakouts or have very delicate skin. They are also good for individuals who opt for more natural age fighting moisturizers. Jasmine Green Tea Moisturizer from 100% Pure does not contain heavy perfumes like many moisturizers, making it a fitting choice for sensitive skin. It also contains Hyaluronic Acid, which helps to keep the skin smooth. Customer reviews on the company website indicate that the product does a good job of keeping skin hydrated. 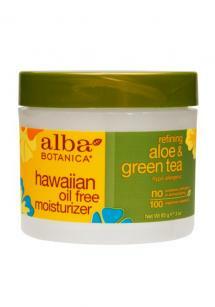 Alba Hawaiian Oil-Free Moisturizer's refining aloe and green tea formula is a hypo-allergenic product and is made from vegetarian ingredients. It contains soothing cucumber extracts to assist in relieving tired skin. This product is great for both men and women and even appeared in an Allure feature titled Moisturizers Even A Guy Will Use. Mario Badescu Oil-Free Moisturizer SPF 30 does not clog pores and is gentle enough to be used everyday. 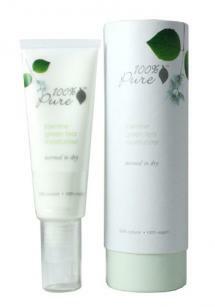 Green tea has been added for its anti-aging properties and SPF has been included to help block UVA and UVB rays. On the WeHeartThis blog, the product was referenced as leaving a 'dewy finish' which helps to control dry patches. Fabindia Green Tea Moisturising Lotion has aloe vera gel and Vitamin E which help to fade dark spots, and even out skin tone, which is great for people of color. On the Sweet & Bitter blog, this product is described as a perfect choice for hot and humid summer weather due to the smooth and light texture that allows the moisturizer to absorb quickly without being runny. The Green Tea Seed Serum by Innisfree has green tea seed oil and green tea water which work together to leave the skin dewy without being sticky. This item is Innisfree's top selling product. On Dr. Poison Ivy's Beauty blog, the product was said to have immediate effects on the skin, reducing dryness without bringing on acne breakouts. Rhonda Allison Skincare Beta Green Tea Lotion can be beneficial for people who have rosacea and oily skin since it contains salicylic acid. The lotion helps balance out the natural oils in the skin without over drying. On Sue's Clear Skin blog, it has been documented how this lotion, in conjunction with other Rhonda Allison green tea products can also help with hyperpigmentation. According to leading tea expert Bruce Ginsberg, green tea is fermented differently, thus resulting in the tea being left with more natural antioxidants than other teas. Green tea houses many helpful antioxidants to the skin which create many benefits. Free radicals can corrupt the skin, which lead to wrinkles appearing. The use of green tea can help to combat this process by reducing the amount of DNA free radicals damage. Green tea can be beneficial for treating sunburns, as it has the ability to repair and comfort damaged skin. It can also helps to keep you safe from the damaging effects of sun exposure. Every time green tea is applied to the skin, it will act as a thin layer of sunscreen. The epigallocatechin gallate (eceg) found in green tea helps to calm inflammatory skin conditions such as psoriasis, acne, and rosacea. It will also help to prevent future blemishes. Adding products with green tea to a skin care regimen will ultimately lead to having healthier skin. With continued use, the tea can repair years of damage and help to keep the skin looking younger longer. Whether you use one of the products described here or if you create your own fresh green tea moisturizers at home, find a green tea product that works for your skin type and document the improvement you see over time.